Finally had a chance to learn this over Labor Day weekend. Interesting game that has slightly more set-up than my favorite Feld game, NOTRE DAME. I liked it though and I think it will move up in that close cluster of favorite Felds taht hover in the top 200. The end scoring can really drive you crazy though. But, when your wife asks to play it the next day, that is a good sign. I had a few minutes one afternoon to play this again. I am beginning to really warm to this little game. It's good for 3-4 quick solo plays when I am interested in a tile-laying game. 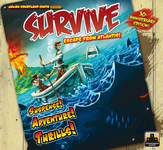 Had some time this month to explore the expansions a bit to this mostly soltaire game. It had been a few months since we had played this and we realized after a couple plays that we had been misplaying the 2nd cartouche, but we just chalked our way up as a current variant that hopefully will not recur. Our game night got shortened one night so we revisited this brief card game. It still has its moments and some strategy. Perhaps familiarity makes it more frustrating when you can't get the right action cards you need. That is also part of the fun. 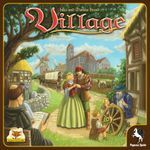 We returned this to the table this month to remind us a bit more about the game before trying out the new Village: Inn expansion. I'm not sure I'm on to something, but I managed to eke out 2 victories this time in the base game and a runaway score in our game with the expansion! Finally, I can maybe get some balance to my horrid losses in STONE AGE! We revisited this game after about a year and a half. Not bad overall with great components...love the gem bag. I must be on a roll or something as I finally won both games of this we played towards the end of the month. These were pretty close--down to us both being within two achievements. And, I almost played the "Fission" card just to make the game last a bit longer! We really enjoyed playing this great looking game. There is a lot more to it than one expects to be sure. Had to play this first new to us game that was in my double-Feld order after a hard month. Great fun and something anyone can pick up.